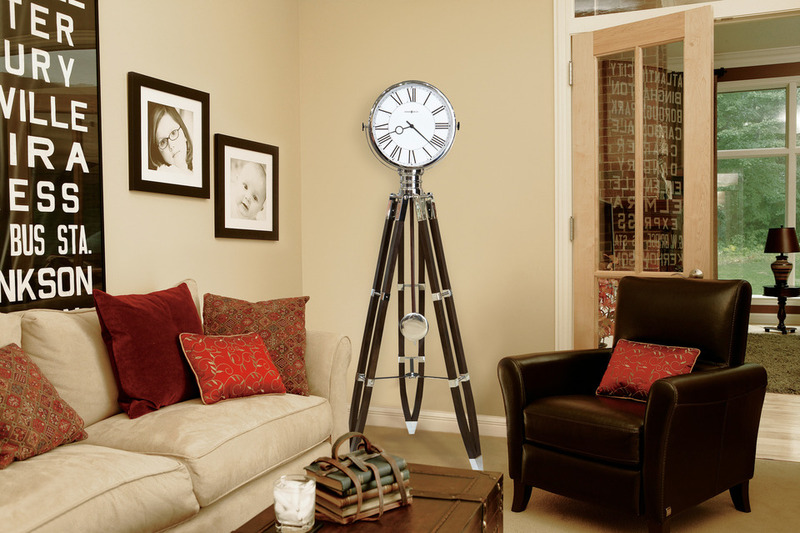 Clock Repair Service also sells Howard Miller Clocks including Howard Miller Grandfather clocks, wall clocks, mantle clocks and Howard Miller Specialty clocks under the name of Howard Miller Atlanta. You can click here to see a full line of Howard Miller clocks we sell. Clock Repair Service is a Howard Miller Premium Dealer, which means, we are an Authorized sales and service center for Howard Miller. We have put together this guide to show the different styles, sized and features Howard Miller offers in there Grandfather clock line. Please feel free to contact us at any time if you have any questions about the any features Howard Miller offers. A new Grandfather clock can change a small, empty area into the classic focal point of your home, as well as fill a large space that will make an incredible statement in your home. Our Grandfather Clocks tell much more than time. They also tell the world you're the kind of person who appreciates good design and fine furniture. Whether you prefer a traditional look or our latest cutting edge styles, you'll find a Grandfather clock that expresses your personality beautifully. Although there are many Howard Miller Grandfather clocks to choose from and we understand you are making a life time choice on a Grandfather clock, a Howard Miller Grandfather clock is a great investment and you are purchasing an Heirloom piece of furniture that will be passed down to many generations to come. Listed below are a few thing to consider before purchasing your Howard Miller Grandfather clock. Your new Howard Miller Grandfather clock will create a new look to your home, as well as the warm, subtle tone of the chimes. When your friends and family leave your home...they will always remember your Grandfather Clock. Howard Miller Grandfather clocks come in several sizes and shapes, there are standard size Grandfather Clocks and "wide body", however there are several styles that Howard Miller offers. 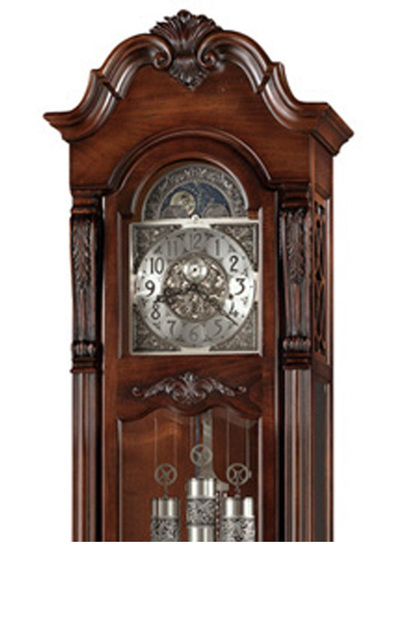 At this point in this guide, it would be helpful if you go to www.howardmilleratlanta.com by clicking here and look around to see the different styles Howard Miller offers in their Grandfather clock line. 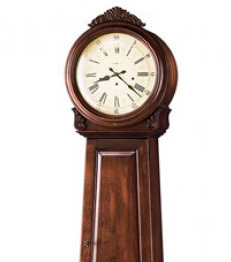 Once you determine the size of Howard Miller Grandfather clock you are looking for, your next step is to determine the features available in each clock. 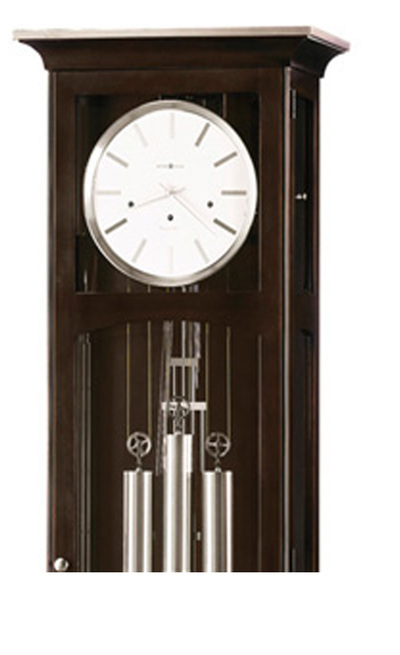 The chiming and melodies features are not an option in each Howard Miller Grandfather clock. Howard Miller chooses the Melodie and chiming options for each model of Grandfather Clock for that model. Listed below are descriptions of each feature that Howard Miller offers. This list will help you understand what each feature is called and what it actually means. As always, please contact us if you have any questions, we are here to help. If you would like to contact us using the form to your right, we will answer your question quickly. You can also contact our shop at 678-462-7856 M-S 10am-6pm. These style Grandfather Clocks use 3 chains, located behind the door that are pulled down once a week to raise the weights that power the Grandfather clock as they drop down during the week. The Westminster chimes will play a few notes on each quarter hour and then play the 16 note melody on the hour, then count the hour. Some Grandfather clocks have an optional lever on the dial located by the number 3 to manually turn off the chimes at will. These Grandfather clocks use a key to turn 3 arbors located in the dial that are wound once a week to raise the weights that power the Grandfather clock as they drop down during the week. The Westminster chimes will play a few notes on each quarter hour and then play the 16 note melody on the hour, then count the hour. Some Grandfather clock models have a lever on the dial located at the number 3, to manually turn off the chimes at will. Grandfather Clocks with an optional “night off” chime shutoff also use a key to turn 3 arbors located in the dial that are wound once a week to raise the weights that power the clock as they drop down during the week. The Westminster chimes will plays a few notes on each quarter hour and then play the 16 note melody on the hour, then count the hour. There is a lever on the dial located at the number 3, to manually turn off the chimes at will. There is an additional lever on the left of the dial located at the number 9, to select an option for the chime to play continuously or to cease between 10:00PM and 7:00AM. Triple Chime Grandfather clocks also use a key to turn 3 arbors located in the dial that are wound once a week to raise the weights that power the Grandfather clock as they drop down during the week. The chimes will play a few notes on each quarter hour and then play the full chime melody on the hour, then count the hour. There is a lever on the dial located at the number 3, to manually turn off the chimes at will or to choose between Westminster, Whittington or St. Michael's Chime melodies. There is an additional lever on the left of the dial located at the number 9, to select an option for the chime to play continuously or to cease between 10:00PM and 7:00AM. On some Grandfather clock models, you are able to turn the ¼ hour chiming melody mode off completely and keep the feature on, that will count the hourly time. These Grandfather clocks use a key to turn 3 arbors located in the dial that are wound once a week to raise the weights that power the Grandfather clock as they drop down during the week. 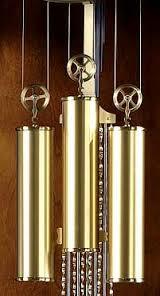 The chimes will play one note on the first quarter hour and one each quarter hour. The movement will then play the full chime melody on the hour and count the hour. There is a lever on the dial to manually turn off the chimes located at the number 3, at will or to choose between Westminster, Ode to Joy or Ave Maria Chime melodies. Your hands never touch the brass on this design. There is an additional lever on the left of the dial near the number 9 to select an option for the chime to play continuously or to cease between 10:00PM and 7:00AM. You may also use an option for the clock only to count the hour without any hourly or quarter hour melody. Quartz Grandfather Clocks use batteries to power the time, chimes and the swinging pendulum. There is no winding and the Grandfather Clocks are very accurate. Most Grandfather Clocks come with a dual chime, offering a choice of Westminster or Ave Maria melodies. There is also a volume control to adjust the volume to the size of the room, chime silence and hourly only chimes. Batteries will easily last a year and are easily replicable. Some Quartz Grandfather Clocks will have the three weights to resemble a mechanical movement, however, these weights do not move and are added to enhance the style and the looks of the Grandfather Clock. Some models of quartz Grandfather Clocks are non-chiming. In most cases a quartz Grandfather Clock is less than half of the price a mechanical movement Grandfather Clock. Most key wound Grandfather clocks will offer a functional, astrologically correct moon dial. Howard Miller Atlanta is a division of Clock Repair Service and we are located in Marietta, Georgia. Our tag line for our company is “A real store, with real people and real values” and we are. Howard Miller Atlanta is a “Premium” dealer for both Howard Miller and Ridgeway Clock Companies, which means we not only are an authorized sales center for Howard Miller and Ridgeway, but we are also a Howard Miller and Ridgeway service center as well. 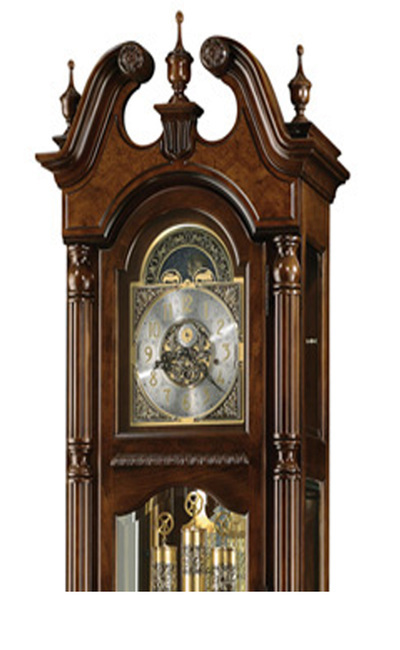 Our company has been selling and servicing Grandfather clocks for many years now. Our service department services around 650 Grandfather clocks through the north Georgia area and we do consider ourselves the go to experts when it comes to both Howard Miller and Ridgeway Grandfather Clocks. We know Grandfather clocks, as well as all types of clocks. Please feel free to shop around on our online store, however if you are in our area, please come by to visit our shop. We have several Howard Miller and Ridgeway Grandfather, as well as wall, mantel and specialty clocks on display. We are always running in-store specials, including floor and sample sales. We will also honor any of our in-store sales to our internet customers. Please call us at 678-462-7856 or email us at info@howardmilleratlanta.com with any questions or price quotes on any Howard Miller or Ridgeway Grandfather Clock, Howard Miller wall clock, Howard Miller mantle clock or any Ridgeway Clock. The price of all clocks sold through www.HowardMillerAtlanta.com Includes free delivery and no sales tax.